The summer of 1994, a flat share in Berlin’s Potsdamerstraße and it’s blazing hot. Back then I was busy tinkering with some simple bass loops on my computer and my loop machine. The speakers helped to spread the loops across the entire flat, a perfect match for the relaxed summer feel. Laurie said: it’s like being under water, in the ocean. An ocean club – all of a sudden, my future had a new home. After years and years of playing in bands I wanted to pursue my own visions – but continue to work with friends. I wanted to create a loose collective, an open club for members: Members of the Oceanclub. I locked myself in the studio with longtime Australian friend Anita Lane and the loops became tracks. Johnny Klimek loved the result and offered to help out on production. In Inga Humpe I rediscovered an old friend from the 80s at the E-Werk and we decided to re-explore the strange power of the butterfly. The work was beginning to take shape. Further members included Danielle de Picciotto and my Malaria and Matador sidekick Manon P. Duursma, I also invited Katharina Franck, Jovanka von Willsdorf and Jayney Klimek and, naturally, included a track by my Miasma partner Myra Davies. In the end, we also needed the obligatory male joker: my Schöneberg neighbour and old partner in crime Blixa Bargeld joined me in an homage to the sun, adding additional sparkle to the ladies’ circle. In 1996 the resulting album „Members of the Ocean Club“ was finally released by Alternation and, to mark the release, we installed the first ever “touch-and-feel Oceanclub” at Tresor. Danielle de Picciotto created a unique, golden underwater seascape (immortalised in a Firething video) and from that moment on every Sunday became Oceanclub day, kickstarting a new phase in the Oceanclub history and introducing Thomas Fehlmann as a constant comrade-in-arms. Chica Paula and Mike Vamp started their DJ careers at the club, Sun Electric turned into eager collaborators and our Mermaid took care of the bar. The Club became a club and took to the world: from a Popkomm stint at the Galerie Lukas + Hoffmann in Cologne to the Steirischer Herbst at Graz, then on to London, Porto or Munich’s Ultraschall – the latter with a swarm of bees (honey pump) and many other themes. In the beginning, I played my own live sets at these events, often accompanied by Jovanka von Willsdorf, Chica Paula and Mermaid Jaculin. Sometimes i played “loops with the audience”, later on I switched to djing and playing my favourite tracks by other artists. 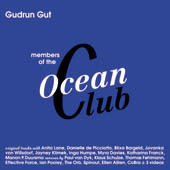 Our next Berlin home was a regular Oceanclub lounge at WMF – documented on our first ever Oceanclub compilation CD (for WMF Komfort Labor). At Berlin’s Volksbühne the Oceanclub went on to curate a series of musical nights for the “entire house”: kölnkompakt, mutestumm and bärenmarke/markeB. The latter, a Berlin label show (see the accompanying MarkeB book at Verbrecher Verlag) soon became Berlin’s annual festival highlight and meeting place for the entire label scene. Since 1997 we have also been doing a weekly Oceanclub radio show, Fridays on Berlin’s Radio 1. An invitation to China exported this show to the Asian realm, followed by our second Oceanclub compilation (for V2): Oceanclub for China. By now the Oceanclub network spans the entire globe, and I am very proud to reintroduce you to its beginnings with this double CD. The remixes featured on CD 2 were only ever released on vinyl and, like the original recordings, have long been discontinued. Some of the remixers involved have now become big name DJs and some are still close friends – a lot of the tracks featured here are reminiscent of the typical early 90s sound, others still sound as exciting and fresh as when they were first released. The seductively simple opener “Woods” (originally a B-side for “Yadiyadi”) has become a firm favourite of mine, and Klaus Schulze did a fairly faithful mix of the original, but nevertheless managed to make it his own. The Orb dub is a true classic. I also love Ellen Allien’s short Butter dub – the “Butterfly” club mix also graces her own remix compilation. In addition, there are the videos: Chilean filmmaker Claudia Eglesias made “YadiYadi” for Ultra Low Budget, the other two videos are courtesy of Angela Conway from Britain: a chemical wedding with Blixa for “Die Sonne” (filmed and produced in London) and “Firething” with Anita Lane and many friends at the first ever Oceanclub at Tresor.